Asphalt Crack Filler: What Are The Benefits? Crack filling is one extremely important pavement maintenance practice that can help to increase the lifespan of blacktop. By using hot rubberized asphalt crack filler to fill minor cracks, you are helping to prevent and stop these cracks from turning into larger cracks, leading to bigger and more costly problems. Crack filling helps to prevent intrusion of water (which is the most destructive element to pavement) as well as other damaging materials/outside elements. The more water penetration, the weaker your pavement base will become. Rubberized asphalt crack filler is flexible, which means during season changes when a crack expands or contracts, the filler will move with it. Patching and crack filling serve to prevent the need for replacement or removal of the pavement by proactively maintaining your existing pavement. Big cracks can turn into potholes which can be destructive and lead to traffic liabilities like flat tires. Extra large cracks can also present tripping hazards which could lead to complicated injury damages. Crack filling will improve the overall appearance of your pavement. 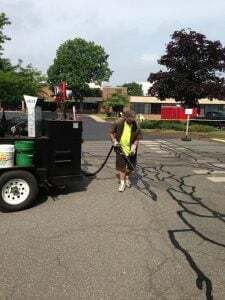 By being diligent about regular parking lot maintenance, you are ultimately saving money because regular maintenance, especially crack filling, will help to prevent asphalt replacement, which comes with a significantly higher price tag than any maintenance services. If your pavement is in a very high traffic area, like a popular storefront, airport, condo complex, etc. it may need more regular maintenance to keep up with the wear and tear from the traffic. Similarly, if your parking lot is in an area that sees a large amount of snow or rain, or is extremely hot, your parking lot maintenance may require more attention than others and/or it may have a shorter overall lifespan. A great way to help increase your pavements lifespan, especially in areas of high heat and sun, is sealcoating because this coating helps to block out harmful UV rays. The proper drainage system design is of huge importance to pavement’s health. Effective drainage (reducing the moisture content) directly affects fatigue cracking of the asphalt surfaces and because of this, proper drainage can extend the life of your pavement. In areas that experience a lot of snow, plowing also plays a large role on your parking lot’s health. Plows can easily destroy pavement, especially when the plowing is done carelessly. Additionally, the added weight and moisture of snow piles can slowly deteriorate your pavement, especially in cracked areas. After a harsh winter, your parking lot will likely need several repairs like crack filling, some reconstruction, and pot hole patching. While all these factors will contribute to your pavements overall healthy duration, the answer to the question, “how long should my new pavement last?”, begins with the proper installation and use of high quality materials. Even if your parking lot is in an area with low traffic, an ideal climate, and is managed and maintained regularly, if the initial pavement installation was done incorrectly, and/or low-grade materials were used, your pavement will begin to deteriorate early. For property owners, paving is one of the largest investments you’ll make on your properties, and because of this it is important to invest in asphalt paving contractors that have the expertise and knowledge to do the job right the first time, and to properly maintain it thereafter. If your commercial property needs maintenance services, repair, or a complete pavement replacement, start off on the right foot and call the experienced professionals at EastCoat Pavement today to get started with your free quote!